A collection of high resolution images for you to use in your marketing collateral and on your website. Click on the links to download images for each product. 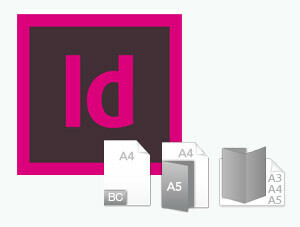 Folders (562mb) | Fabric Displays | Everything else (312mb). Looking for a starting point or simply want to make it easier to build your creation? 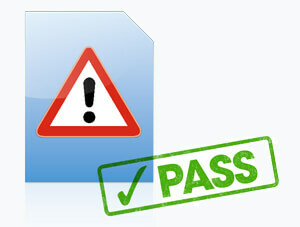 We have a number of example files for you to start from. Create great seasonal branding for your clients by using our 2018 calendar templates. 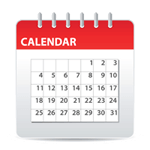 Download a 2019 calendar to start your design. 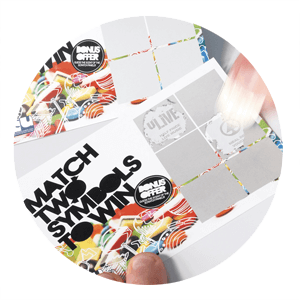 Our scratch cards are really versatile – you’re in complete control over how they work. 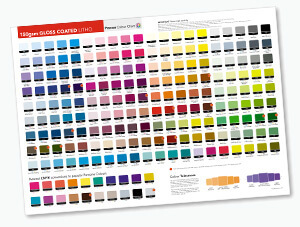 Colour charts are available for our main paper and card stocks. 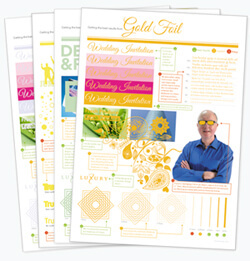 Great for inspiration and getting an indication of the colours on your final printed items. Get more from your print with our "Getting the Best from" sheets on Embossing, Spot UV, Foil and Die-cutting. The sheets contain our best practice guidelines. 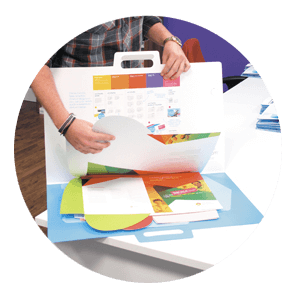 Our giant folder sample suitcase contains a selection of samples from our folder range. All the samples are unbranded and great for showing to your customers. Request yours today and one of our lovely Account Managers will drop it off at your studio as they are too huge to be posted! 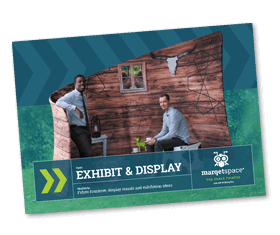 Inside our new guide, you’ll find great display ideas for all types of indoor and outdoor events, promotions, trade shows and exhibitions. 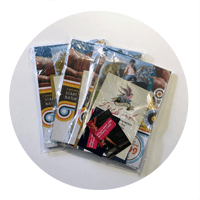 Our pre-made packs are unbranded and come in clear, sealed A5 bags ready to easily send to your customers. Each individual pack weighs 156g so they fit in to the lowest Royal mail postage bracket. As us for details or to order. 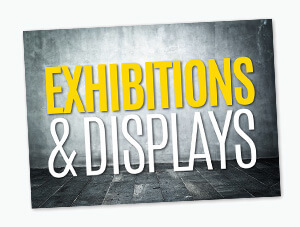 Our exhibition range is made from all different types of fabric. This swatch book shows what each type of fabric looks and feels liken it's raw, unfinished state. Depending on what you'd like to use it for, we'll finish it to suit. 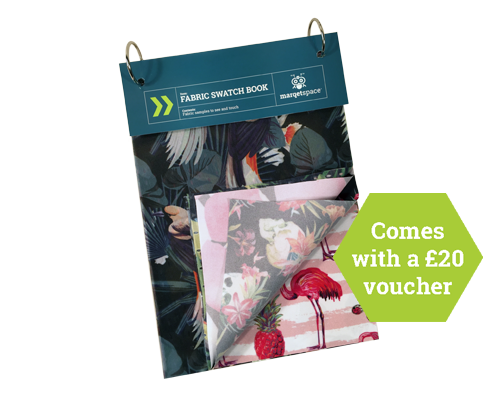 Buy a Fabric Swatch Book for £10, and we'll also send you a £20 voucher to use on any products in the Ink on Fabric range. 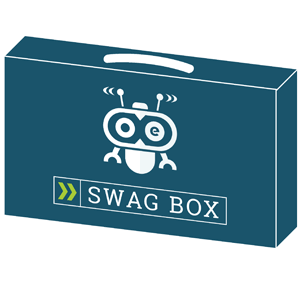 If you need extra samples for a promotion or event you can buy additional Swag boxes for £10. 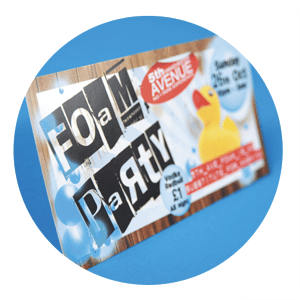 It contains printed samples for our core range of lithographically printed business cards, flyers, leaflets and more. All the samples are unbranded and great for showing your customers. Send to your clients to help them visualise how the fabric products could help promote their business or make their event more memorable. Pre-printed copies of the unbranded Exhibition & Display brochures (contains no pricing information) are available to purchase in batches of 25. Want even more tools to help you sell? A partnership with Grafenia might help. Use our brands to grow your business. Left it to the last minute? Or someone just sprung something on you? No problem! Place your order by 10am and we’ll despatch your order the same working day on a wide range of items. Just choose the Next day service level when creating your order and we guarantee we’ll despatch your order the very same day.